Solicits independent thoughts about the organization's major issues beforehand, getting individuals thinking about the future. Builds trust and understanding by facilitating interactions between team members as they pool their collective insights to create a short, mutually understood, prioritized, and actionable list of the current issues. Builds a shared visualization of the future they are all striving to reach. Creates the framework that informs their daily focus and prioritization. Identifies this year's focus on status quo changes that accelerate motion toward the shared visualization of the future. Do the members of your organization want to verify that a proven strategic planning process will be of value for them? Does your organization have the internal ability to maintain implementation momentum during the planning year? 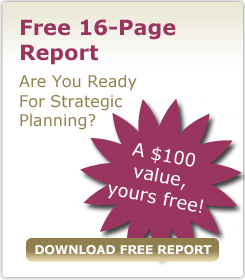 Does your organization have limited resources but want to maximize the value of your strategic planning investment? Are you and your team tasked with providing a strategic plan by your Board or investors? $8,500 fee*, plus expenses, for Myrna Associates that covers the use of our process, processing of pre-annual meeting input, facilitation of the planning meeting, preparing the Microsoft Word and PowerPoint documentation, creating and shipping planning notebooks with CDs for the planning team. Interactive communication of this year's strategic plan, including a strategic planning tutorial, to the next level in the organization.